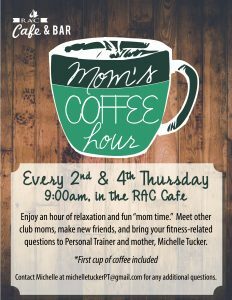 Enjoy an hour of relaxation and fun “mom time.” Meet other club moms, make new friends, and bring your fitness-related questions to Personal Trainer and mother, Michelle Tucker. *First cup of coffee included. Contact Michelle at michelletuckerPT@gmail.com for any additional questions.